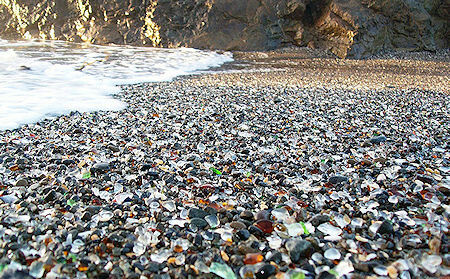 Glass Beach is a beach in MacKerricher State Park near Fort Bragg, California, USA, that is abundant in sea glass created from years of dumping garbage into an area of coastline near the northern part of the town. In the early 20th century, Fort Bragg residents threw their household garbage over the cliffs above what is now Glass Beach. In 1967, the North Coast Water Quality Board and city leaders closed the area. Various cleanup programs were undertaken through the years to correct the damage. Over the next several decades the pounding waves cleansed the beach, wearing down the discarded glass into the small, smooth, colored trinkets that cover the beach today.